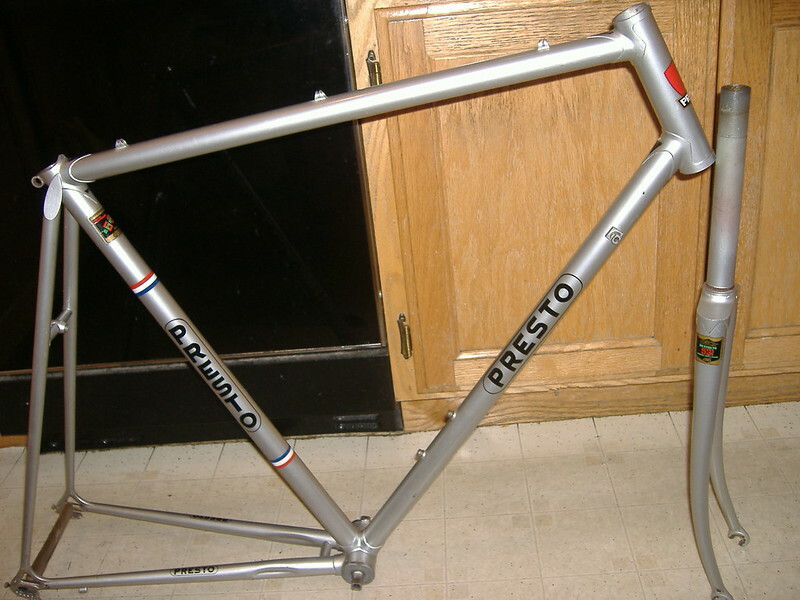 I finally located my photo file of the Presto frameset that I bought from Hilary a few years back. I'm especially interested in finding out when this one was perhaps built. That's nice looking, the lugs appear paper thin. What is the tubing? Are the 531 numbers red? what does that mean? If I recall correctly that is the lightweight stuff. It might also help suggest a date of mfg. if they are original. Thanks, the Reynolds transfers say "special lightweight", which I believe means 531SL. Sorry, but I haven't yet weighed it. 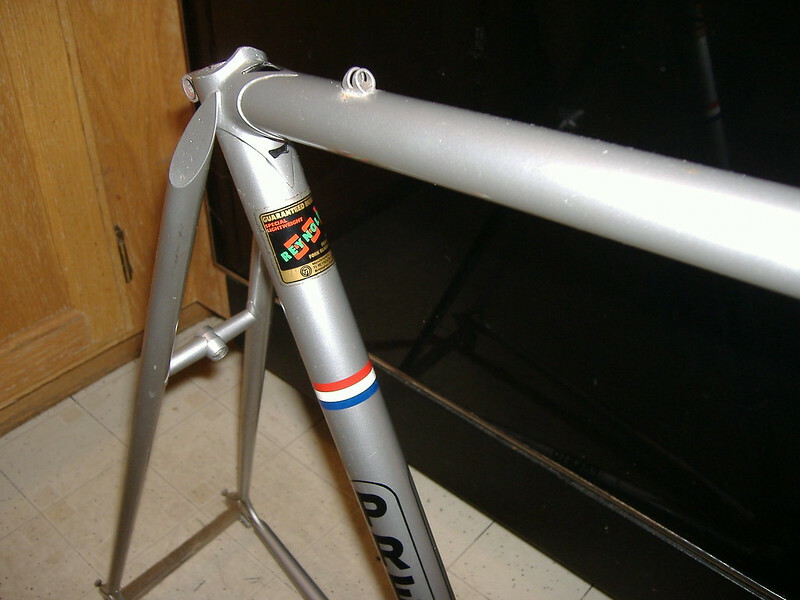 Jan Legrand built the frames for Raleigh's team riders for some years. Knowing the build date would help me make an intelligent parts selection. I'm leaning toward an early Super Record build, but still wanting more info. 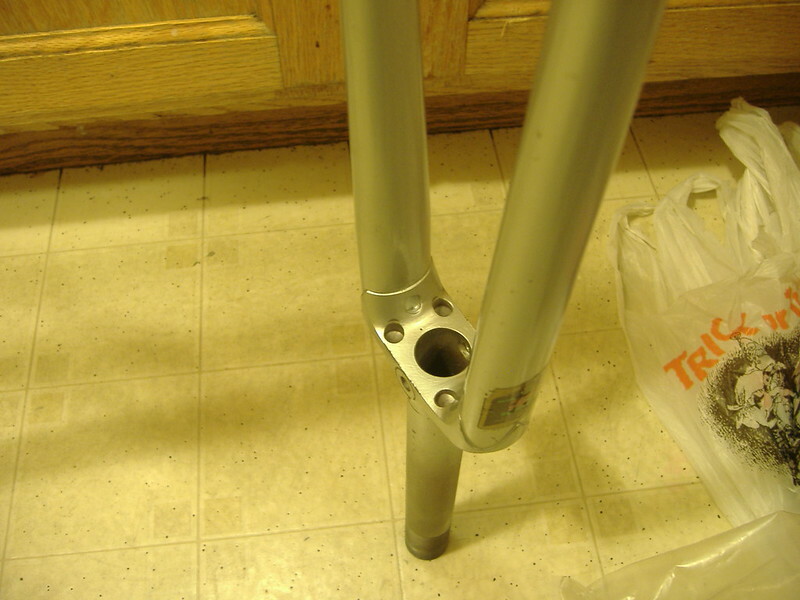 There is Legrand's triple-X logo subtly engraved in the seatstay caps. I was told this was a very special frameset, and I liked it, so I bought it (shipped from England). Last edited by dddd; 04-23-14 at 07:30 PM. I recall the special lightweight stuff being late 70's. Before they called it 531 pro or something like that. It sunset with the development of 653. Which I recall being the late 80's. Thanks for the tip, now I'm calling on all or any Dutch-speaking Bikeforums members who might assist with communication, either translation or direct inquiry. When I try to read Dutch, I mostly can't fathom even a single word. Sign language might be my only hope. When I was in the Presto shop two years ago it was mostly staffed by young fellows. But at least one of them spoke English. And there was one slightly older gent who may know some history. You might try emailing them. I even like their modern Presto jerseys. I would order one of those if I owned a Presto. I bet if you sent an email with images even in english, you would get a reply. in the mid-70's i had a cycling friend who had been living and working in amsterdam for a time and came back to the u.s. with a couple presto machines. he spoke of visiting the workshop. i recall the triple x logo on the seatstay caps. they were handsome bikes but after ~forty year cannot recall a great deal of detail regarding them. I had the good fortune to have dinner with Jan Legrand once, not that he'll remember, LOL. Pretty much everyone in The Netherlands speaks English, along with one or two other languages, so no problem there. What a fantastic frameset. Yet another maker to add to my bucket list. Paper-thin lugs is right. 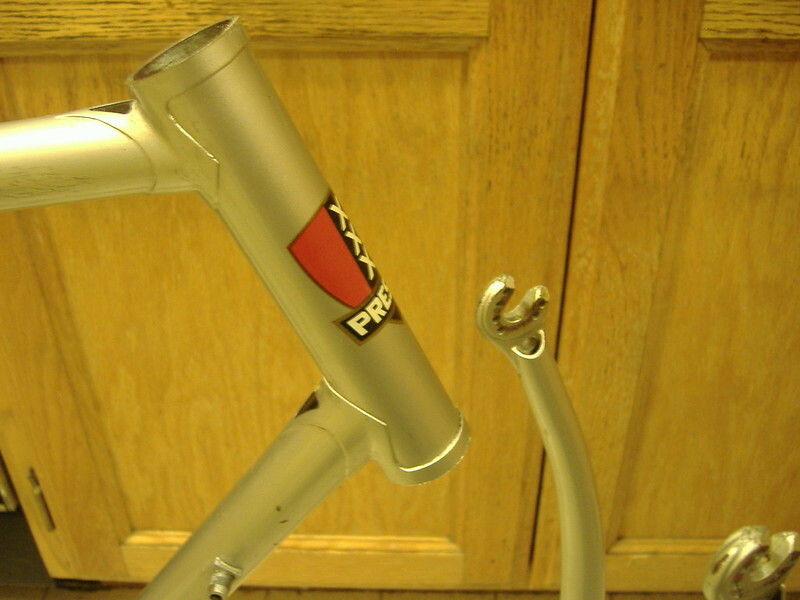 I like the unusual lug window above the tubing decal as well. An early Super Record build would be tops. Maybe even get Drillium Dude involved to match all that awesome milling on the frame and fork (even up inside the exposed fork blade!). This is awesome, firstly finding out there is a Presto bike shop (thanks, repechage), then that they somewhat probably speak English, a fellow that met Jan Legrand (is the man still around? ), and some compliments to the weight-weenie status of my frameset, with suggestions of Drillium to fill it out. I can dig it, is all I can say, and suddenly look forward to hitting the hills on this proper lightweight (I have yet to piece together a vintage steel LIGHT bike, oddly enough). I've got a Limongi as well, the closest thing to this Presto I think. That is one fast bike that taught me the reality of rider forward = fast, a bike I struggled to come to terms with until finally I put an Ideale saddle on it, and began discovering aero supremacy. I feel as if I have been defying old age ever since! Starting from scratch, will Simplex Retrofriction shifters be proper on this Presto? I'll next be trying to complete a wheelset that will do both the Presto and the Limongi justice. Should it be Rovals or perhaps a traditional pair of tubulars? I really can't afford to keep more than one pair of fresh tubulars glued up, and actually haven't gone the tubular route since I put a few hundred miles on my 1952 Christophe some five years ago. Nice Presto, dddd! The serial number should give some info as to the year of build. If it is from the late seventies, or later, the first two digits should give you the year. There are a few other Presto owners on this forum. Elev12k, humanreisberg and s70rguy come to mind. Their bikes are here somewhere, have a search for them. Perhaps they'll chime in as well. Non-fixie is right, the first two digits from the serial number under the BB shell should be informative on the buildyear of the frame. They will surely react to your request about the frame as the current owner Loek Valk was also around in the 70,s and has also identified my bike as a Legrand build Presto for me. I sort of think the frame is somewhat earlier then my own bike as the Presto's from the second half of the 70's all had the smooth and chromed forks and square brake bridges, but each Presto was a one-off build so it is very well possible Jan decided to build this one with a different kind of fork. I like the drilled drops and open fork ends, a lot of Presto's had those. Last edited by pullup; 04-24-14 at 12:33 AM. Thanks for posting this special Presto frame, you sure got us Dutchies' attention! That lugwork and fork crown is something I hadn't seen before. The paint looks to be in great condition as well. Would love to see some more detail shots, like the rear drop outs, the rear of the seat lug and the BB shell (any X's or holes in it?). I visited the former Ti Raleigh and Panasonic team soigneur a couple months ago and he told me that Jan Legrand is probably living in Canada now, refusing to want to have to do anything with cycling. I think something went wrong within the Peter Post team in the eighties, but the soigneur wasn't willing to tell me much more on that. He only had positive and amazing stories to tell about how great of a mechanic and good friend he was. btw I vote for first gen SR on that Presto, if you can get your hands on it. I only saw two cool, vintage bikes during my brief visit to Amsterdam. A Team Raleigh that was in the right hand window of the Presto shop, which looks to be gone now, and this old Presto. 32 hole low flange Campagnolo Record 3 cross tied and soldiered is what I think it should have. Probably Mavic rims. Tubulars. That is an exceptional bike, I'd almost take it over an early 1970s Masi. Another great find Dave. Too bad it's too small for you. Happens to be my size. So I guess It will be going to a good home (mine) in the near future??? Hmm, fairly long top tube, ...and I do seem to be shrinking with age as I type. Hey, I've got a nice Calfee for you Joe! Lemme dig up a 110 neck! Last edited by dddd; 04-24-14 at 11:55 AM. Thanks for all these pictures, all the useful info, and the positive comments. I had been too lazy in trying to find out what I had purchased. Sorry to hear Mr. Legrand has exited the cycling picture, but glad to hear he is still around. A Presto jersey is on my bucket list of acquisitions now. one build out option that would be age and quality appropriate would be a mavic ssc gruppo. in thinking about the two machines my friend brought back to the u.s. from amsterdam in the mid-'70's one thing i recalled was that they had distinctive brake bridges. are there some examples which received and x or other unusual pattern brake bridge? this certainly is a wonderful frameset dddd; thank you for sharing it with the forum. thanks very much Elev12k; that is it!